I'm a bit negative on this, so I'm not going to rant and drive down my Serotonin. Suffice to say, that's why I go down a different route than seismic hazard studies. 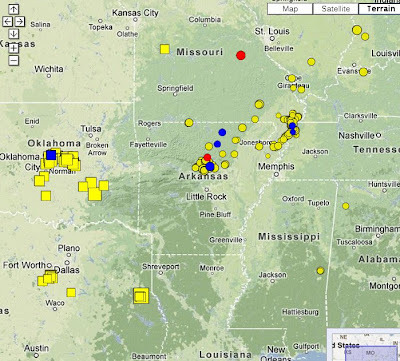 I sure hope they are still injecting in Arkansas, since there is too much activity. Some new earthquake zone has to form outside the main New Madrid area, in order to move onward. We do know these zones aren't something brand new since 18-whatever. Even if they are injecting, I just think it advances the clock. 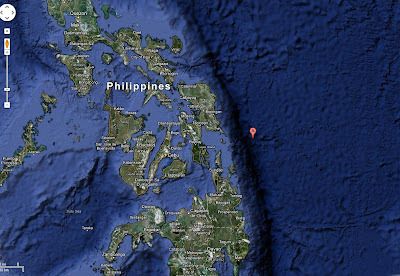 Another earthquake in a beautiful tectonic zone. 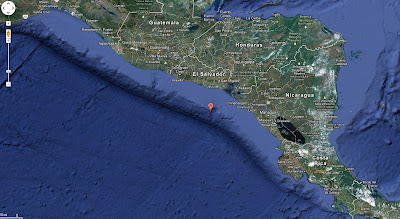 This subduction zone is quite curved, so I wonder if it can rip a full M9 (at least an 8.5). 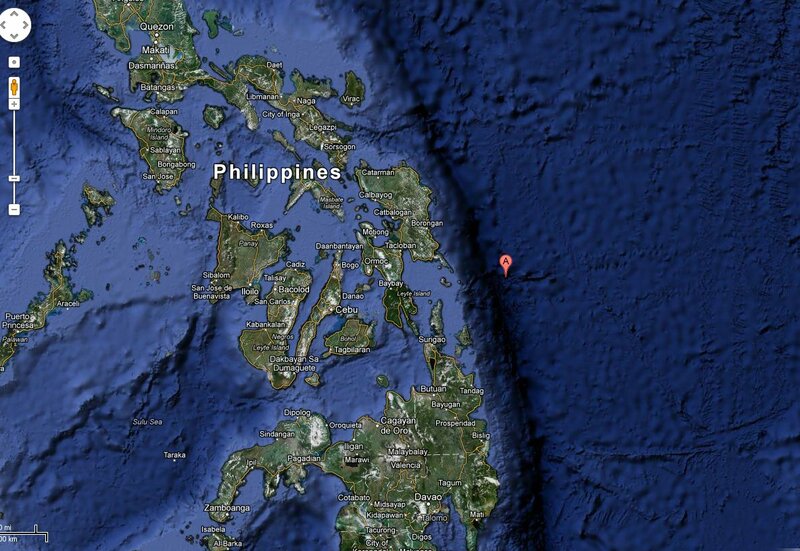 Anyway, this was a deep thrust earthquake in the oceanic crust. They say they 'normally' get normal faults in this zone, since we would expect a pull by the old, cold, basalt. 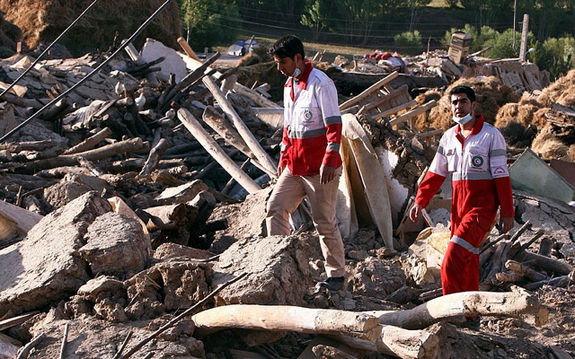 But if there's enough action, there could be a push, which is what this earthquake is saying. The oceanic crust is weak, so we can't get much PGV, and it's too small for oceanic disturbances. The things that fell down must have been on the verge of collapse. Once again, be on your toes for the next few days, 10% chance of something bigger. Very nice weather for August. Hot during the day, and the fireplace at night. There is nothing better for the old Serotonin, and it dissolves depression, ready for the next earthquake! Still very dry, and a lot of swamps are totally gone. Not much news on this yet. 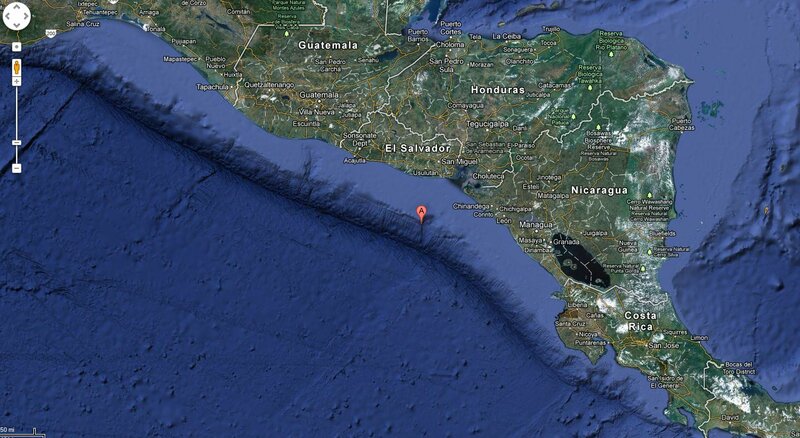 This is a 'baby' for such a subduction zone, which you can see, could easily rip into an M9. The PGV on firm ground will be less than 10 cm/s, which shouldn't crack plaster. But with the general building stock in this area, you might expect minor damage, and some landslides, if the slopes are wet. Swamps, as usual,, will amplify by at least 10 times. M7's are great foreshocks for an M9! The site of the first interesting earthquakes connected to deep injection. They'll stomp on this one soon. ps, I am not railing against stupidity, I just thought this was interesting. I mean, what happened to the old guy who shouted at the charging Light Brigade - "Yer a bunch of idiots!" Probably shot himself. The days are shortening, and I'm starting to feel it. Cottage life has been fantastic this year (beginning of May! ), but it's coming to and end. The most important thing to fight depression (other than my necessary drugs) is to have a sense of accomplishment. I don't know why, but my blog doesn't do that. I get no feedback, and certainly no money. It's more of a destructive compulsion. Tunnels are quite safe in California. As long as the tunnel is stronger than the surrounding rock, high stresses cannot get to it. 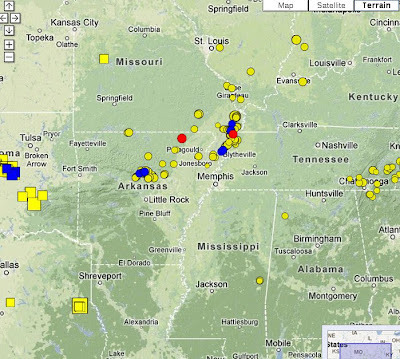 Most earthquakes are low-stress events (low PGV). I once did a study on this. I find this interesting, since they are excavating the want I would have wanted for the Niagara tunnel. They are using two stages, and grinding the rock out. With Niagara, I would have finished with a more elliptical section, to cope with the high stresses. Here, they have soft rock and low stresses. 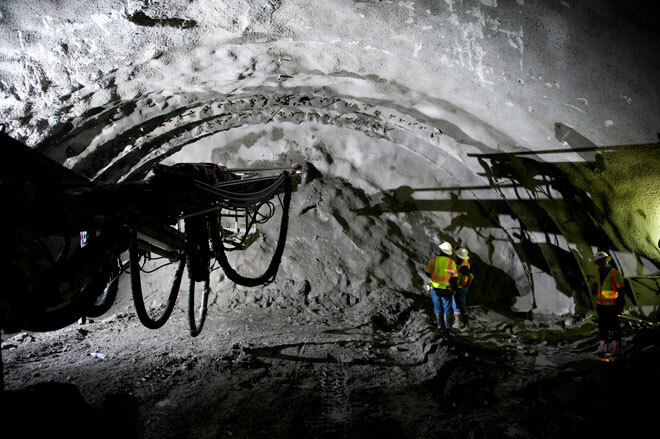 With the existing new Niagara tunnel, we can expect the tunnel lining to start cracking in a few years. So, I'm swimming against the tide here, since the formal notes indicate strike-slip. But this the land of very intense shallow earthquakes, and I have called them the 'Fist of God', or a hammer-strike earthquakes. 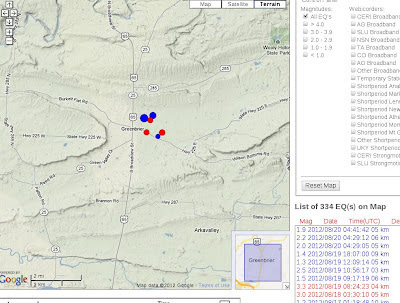 Also there were two earthquakes quite close together. What happens is that there is a blind thrust which defines a nice valley. People love this valley, and build nice rubble houses. Every 500 years or so, it lets go (after all it has to keep up the valley). The propagation velocity goes sonic, perhaps super-sonic, but well over the normal shear velocity. We've never measured on the top of one of these things, but it can lift giant rocks into the air. I estimate over 200 cm/s PGV (I never mention evil PGA!). 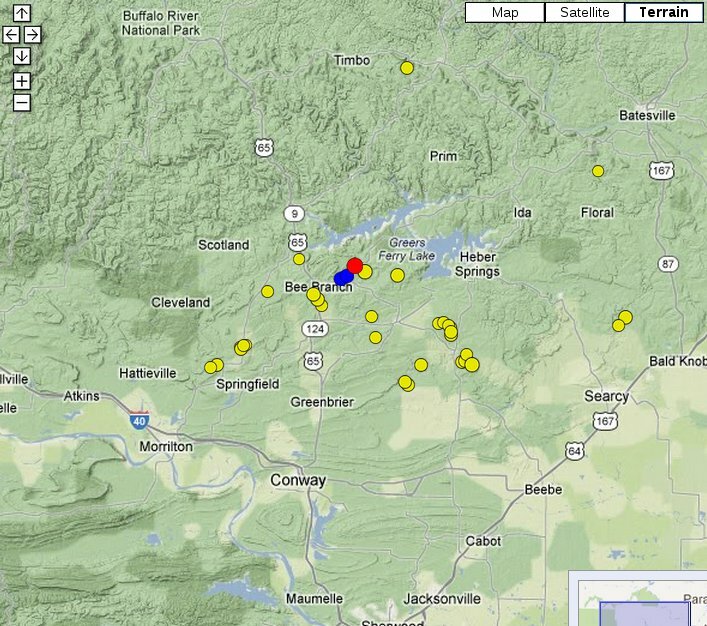 The bizarre nature of these earthquakes can easily fool distant seismometers. If you had GPS you would see the valley go down, and the hills go up. The nature of super-shear also means that the damage is extremely severe for the magnitude. 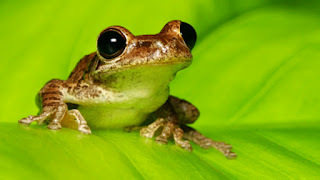 I just like the frog! Here is my Annual Global Warming Report. We 'purists' are relieved that the semantics have changed. Gone is the concept of explosive exponential temperature rise, and CO2 has died a quiet death. Now it is 'Human Activity'. Who can argue against the physics of that? In Canada it is getting warmer, as we enter another interglacial warming period. It is a linear rise since 1860, and I'm sure we humans are somehow to blame (good Mother-induced guilt), and not the frogs. For Canadians, do we want a return to the end of the last cooling period in the 1820's? The temperature was always a brisk -40, and the snow didn't stop for 6 months. All the poor farmers got frozen out. So, as we know, I was coming home from the cottage and the car was singing a funny tune. I had no idea what it was, and hoped to get home before it blew. On the 401 there was a big clump and I got to the shoulder safely, just in time to see my tire rim roll on before me. I find this somewhat ironic, since this is equivalent to an M9 earthquake in the car world. The rim fatigued perfectly to a massive blow-out. 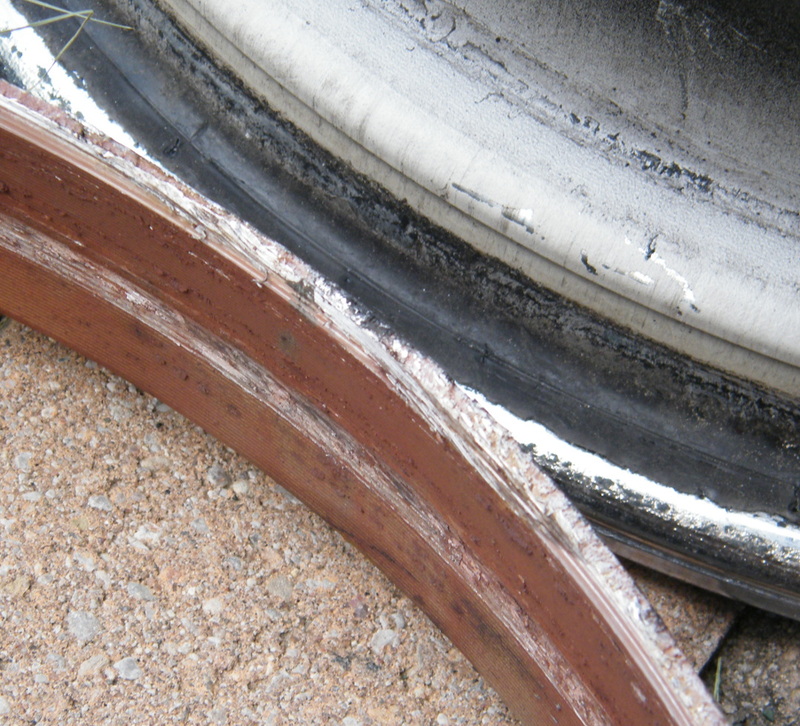 Had a smaller cracked developed, the air would have gone out of the tire, and end of story. But no, it had to be a perfect storm. Ignoring the damage from the shattered lug nuts, you can see a perfect fatigue surface from the outside-in. If I were in the States, I'd start a class action of 1, since nobody has ever seen this before. I hope it doesn't become popular, since everybody can't bring the car in like I did. The van just needed a new rim and tire. If you went back further in time, you would see many suspicious clusters that started and stopped. We must assume that people 'wildcat' an injection well, and start putting 150,000 barrels a month into the Precambrian. Then there are earthquakes and the well is closed. On to another well! This game only works if the fault is 'rough' in fractal terms. 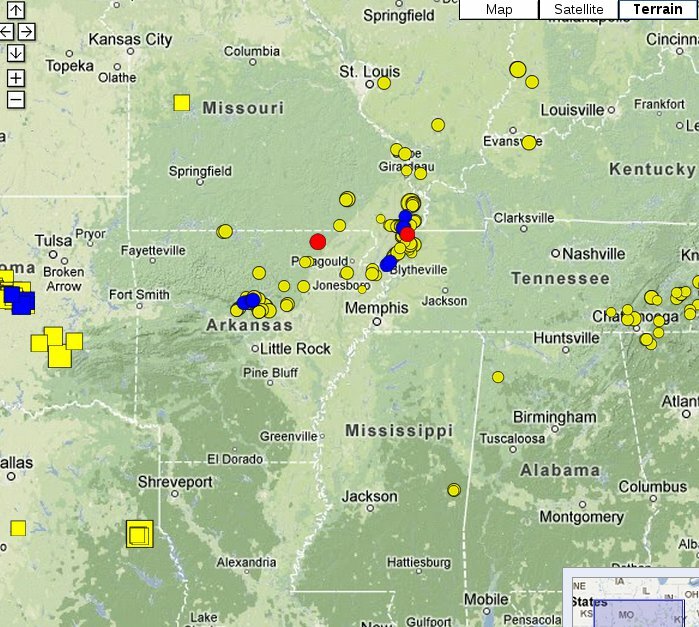 That is, you have a lot of little earthquakes for each big one. If you randomly inject all over the place, I'm sure you will find a 'smooth' fault, which shoots big ones without warning. In fact, this is par for the course, as with Virginia. I find this interesting, but only a 30% chance of developing into something serious. As I've said, the New Madrid system has shot its load, meaning it is all in a stress shadow. The only way to resuscitate this dead body, is for it to grow into the surrounding stress field. It is also possible for the surrounding rock to crumble, thus closing the arch of low stress. I've been looking for the central section to start extending, but it isn't. However, we may be getting a parallel section starting. Since it is a straight line, its only effect might be to load the central section. 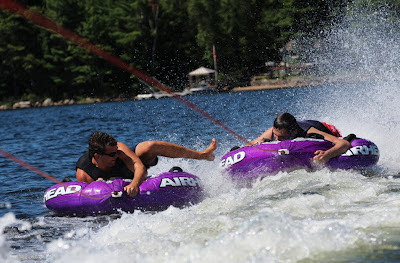 Tube fighting is a sport developed by our family, and taken to its heights by the big boys. There are no rules. The object is to knock the other guy over. Most damage can be done in the 'Slide'. That's where the tubes respond to a sharp turn and bounce from one side of the wake to the other. The receiving tube must be well leaned into the turn. 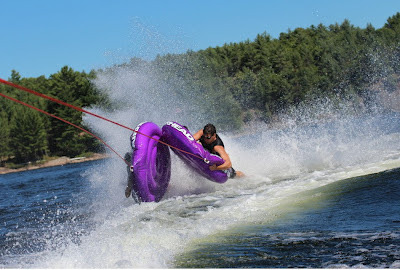 The attacking tube must control the speed and hit at the right moment, preferably when the other tube is bouncing high on a wave. Update: Forgot the conclusion. Big guy wins, other guy meat. Our loving sugar-daddy, who gives us all these things for free has been forced to go even more corporate in order to get drm Hollywood. As such, you have no hope on searching for 'torrent', since any site that Hollywood dislikes will be assigned to the search trash bin. They have done a fundamental algorithm change, so you just know that affects all the rest of the world, not just the US. The appeals court found that spent nuclear fuel rods stored on site at power plants "pose a dangerous, long-term health and environmental risk." The NRC fought for decades to build a national waste storage site at Yucca Mountain in the Nevada desert, but that plan was scrapped two years ago by the Obama administration. Wow, once again the US courts have shown that they will rule on anything any time. This kills new nuclear for now until they can do something, since you can't get around such a broad statement. Each such delay adds another billion to the cost. But in reality, I knew that killing Yuk-yuk Mountain would eventually have an effect. I mean, you can't live in La-La Land forever, saying that rusty barrels on the shores of urban rivers are safe for all time. And earthquakes make a hash of pool storage. The US used fuel is much hotter and more dangerous than Candu fuel, due to the enrichment, and must live in pools longer. All this makes new AP1000's cheaper for us! Of those, 23 were located within about two miles (3.2 km) of high-volume injection wells that pumped more than 150,000 barrels per month of water underground, Frohlich wrote in the Proceedings of the National Academy of Sciences. I am amazed. 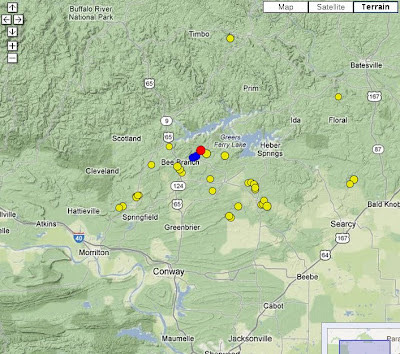 As I've said, the whole injection earthquake thing seems to be over. Somehow I can't believe that they have cut down on injection. 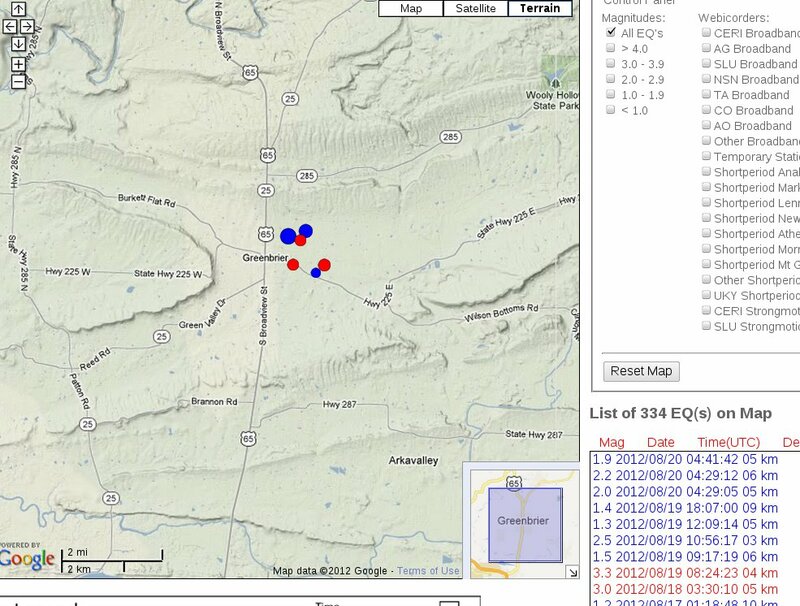 So most likely, they have abandoned sites with 'rough' faults (lots of little earthquakes before a big one), and have gone to 'smooth' faults (no warning). After a horrible drought, we got 'rained' back home. Really, after 2 days of rain, you get cabin fever. But the drought is over, along with the fire ban, so we did some burning. The swamps will never fill up until next spring. So, just north of us there was a little forest fire. We first noticed things when giant turbo twin otters flew over us. Then they dipped into out lake, filling up their pontoon tanks. These are magnificent water bombers. There were 3 of them, and they kept it up on a short cycle for about 2 hours. They could only use our section of the lake because there was a stiff SE gale, and we have a low exit out of the lake. They would come in, fill up, and barely make it out. Tremendous power, only the gov't can afford these things, but I think it was very cost effective to nip it in the bud. Fire was in the middle of nowhere, and a lightning strike, but it took that wind to fan it up. 2-4 acres.